Since it's Friday, it's time to look for the blessings in the past week. I'm glad you're here to read my Friday's Fave Five. :) We've had a full week ... stressful at times, but with some wonderful blessings ... so I'll get right to the list. My sister and her family were in town for a few days, so we had a chance to visit. My son got to spend time with his cousins while the adults caught up. No more parking adventures at the hospital! My appointments are now earlier in the day, when parking spaces are more available. On Thursday I had my tenth radiation treatment, which means that I'm one-third of the way through the treatment plan. To celebrate, Mooseman and I stopped for hamburgers and a Frosty on the way home. Family and friends have kept us well-supplied with sweet treats. We've been enjoying cookies, brownies, homemade baklava, and a special ice cream cake. One of my friends who brought dinner also brought a ready-to-mail thank you note, complete with self-addressed stamped envelope. The note was so, so funny ... much more entertaining than what I would have written! What have been your favorite parts of the week? 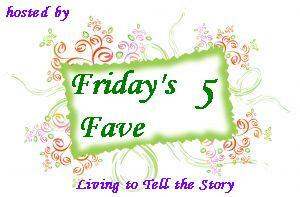 Feel free to share in the comments or visit Susanne at Living to Tell the Story to link up to Friday's Fave Five. So let me understand? Your friend made you thank you notes that you can just pop into the mail? Sweet!! You are sure blessed with good friends and family. I love the cake. Congrats on getting a third of the way through your treatment! Keep celebrating the milestones! Congrats on being half way through radiation! I know all about parking trouble, I live in SF and I got my car towed twice during radiation (I had it for 6 weeks, daily). Hang in there, you can make it throught! So glad that you are getting through the radiation ok. You will do just fine. I made it through 6 months of chemo for breast cancer over 20 years ago. God has been good. Have a great week. The idea of that note totally made my day. Very clever. What a wonderful cake to be brought to you. I can imagine how encouraging that is. Yay for being 1/3 done. Praying the next 2/3 goes well and quickly! What a great idea for the self written, addressed and stamped envelope. I may steal that idea. Hurray for being 1/3 finished with radiation. That's a milestone to celebrate! Glad you are halfway through with your treatments and that parking is easier now. I love to see our kids enjoying their cousins glad your family had fun with theirs. Have a great weekend. I love the cake. Congrats on your achievement that is great and you are so lucky to have great friends that support you. Amazing. I'm a new follower and I look forward to reading more posts. True friends are such a treasure. I'm glad you have many. What a funny idea.. to include a thank you note! Congratulations on meeting this milestone - you are in my prayers. Glad you are surrounded with such wonderful friends and family! Yay for getting through 1/3 of radiation! Prayers that the rest of it will go smoothly for you. Hugs! first, my favorite from your five – is the last one, because it's like icing on top of the cake – the Jeremiah cake :-) you are one brave mama, and deserve support – and prayer - and I want you to know I just finished one. God bless and keep you – and God bless each and every one of yours. All those lovely sweet treats should help keep you going ;) Been thinking of you often! Stay strong. Blessings and Prayers for you and your family! i want sweet treats too! speaking of the frosty.. have you tried that berry almond salad at wendys? A-MA-ZING! I love the cake! I'm sure it was delicious. Congrats on your treatment progress and have a Frosty whenever you feel like it!